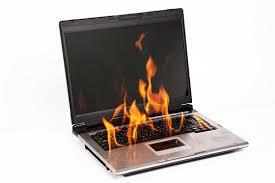 Have you noticed that your laptop has been getting hotter and hotter especially after leaving it on for a few hours. Laptop's fans are notorious for collecting dirt, dust, and other chemicals in the air. Some of the things suggested in this article should help you cut down on your heat issues and keep your computer breathing better. Laptop ventilation systems are in weird places, such as underneath the laptop, on the sides, you do not want to block the intake or exhaust areas. Because of this here are a few tips to keep your laptop's heat down.. Observe where the intake area/s are (this would be the vents where the fan/s are) and the exhaust area the vents where the warm air blows out, make a mental note of it and make sure you never block those areas. During high pollen seasons, limit the time you use your laptop outdoors. These particles are nasty and clog up systems faster than anything else. Avoid smoking near computers. This will cause nicotine build up on your fans and burn them out. And a burnt out fan disables your computers ability to keep it self cool. Consider investing in a USB powered laptop cooler. I use one of these on my laptop and I've noticed a significant increase in performance when the laptop temperatures are kept cool. Put your computer into standby when your not using it. The less the computer is on, the less heat it will generate and prevent it from over heating. Below: Typical Laptop cooler - helps airflow circulation.